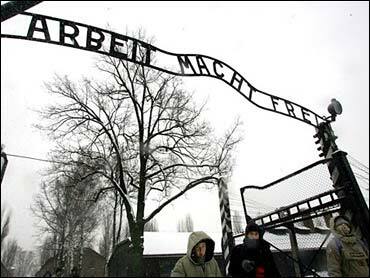 BERLIN -- German prosecutors say they've charged a 94-year-old former SS guard at the Auschwitz death camp as an accessory to murder. Prosecutors in Stuttgart said Monday the suspect, a German national born in Serbia whom they didn't identify by name, was charged as a juvenile because he was 19 at the time of the alleged offenses. They say he served as a guard at Auschwitz in late 1942 and early 1943 and estimate that 13,335 people were sent to the gas chambers during that time. According to prosecutors, the suspect has said via his lawyer that he wasn't aware of the background and aims of what was happening, or of details of the killings. The charges come about a month after another former Auschwitz guard, dubbed the "Accountant of Auschwitz," died before he could begin serving his 4-year sentence. Oskar Groening, 96, died in March. He was convicted in Lueneburg in 2015 as an accessory to the murder of 300,000 Jews. The Lueneburg court concluded that although there was no evidence of involvement in a specific killing, Groening knew that Jews were being slaughtered at the German death camp and supported the killings through his actions.